In Speedwell Blue with dark blue seats piped white and dark blue trim. 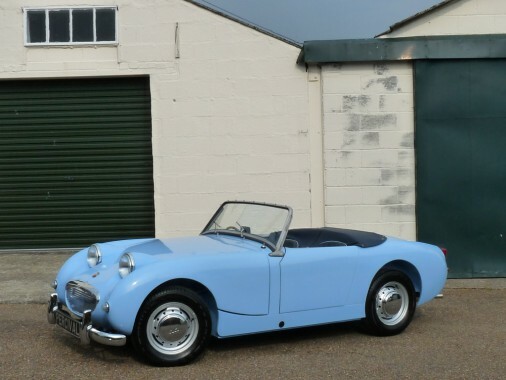 The Sprite has recently completed a full restoration with the bodywork receiving new wings, sills and floor pans amongst other things and a beautiful paint finish in period Speedwell Blue. New chrome, the interior, the hood and tonneau, and restored wheels with new tyres are fitted and the brakes and suspension have been overhauled with new or refurbished parts. The engine was rebuilt from the bottom up and converted to run on unleaded petrol. The gearbox was found to be in excellent order and was refreshed and repainted. There are countless invoices and photographs detailing the build, mainly from AH Spares, and it cost the owner in excess of £30,000. However, a change of direction with his motoring needs means that the Frogeye is now surplus to requirements, and he has reluctantly decided to sell the car.